"I will give you hundred times of what you give Me" These are the words of Shirdi Sai Baba when He asked for Dakshina as per Sai Satcharitra Chapter 14. I would like to quote few lines as said by Mr. B.V. Dev of Thana. "Baba did not ask Dakshina to all. If some gave Dakshina unasked, He sometimes accepted it and at other times refused it. He asked it from certain devotees only. He never demanded it, from those devotees, who thought in their minds that Baba should ask for it and then they should pay it. If anybody offered it against His wish, He never touched it and if he kept it there, He asked him to take it away. He asked for small or big amounts from devotees, according to their wish, devotion and convenience. He asked it, even from women and children. He never asked from all the rich for it, nor of all the poor. Baba never got angry with those, of whom He asked Dakshina and who did not give it. If any Dakshina was sent, through some friend, who forgot to hand-over the same to Baba, He reminded him of it and made him pay it. On some occasions, Baba used to return some sum, from the amount tendered as Dakshina and ask the donor to guard it or keep it in his shrine for worship. This procedure benefitted the donor or devotee immensely. If anybody offered more than he originally intended to give, He returned the extra amount. Some times, He asked of some more Dakshina than, what they originally intended to give and if they had no money, asked them to beg or borrow from others. Of some, He demanded Dakshina three or four times a day". This is very well known to us. Following is story of Shri Kashiram in whose mind proud arose regarding his giving Dakshina to Baba and how Baba destroyed it. Initially Bhagat Mhlasapti introduced Kashiram to Baba. He used to give some Dakshina regularly to Baba from his daily income. 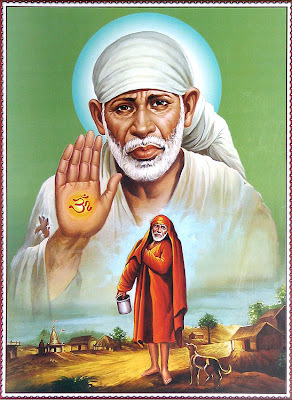 Sai Baba used to keep His desirable amount and returned the remaining amount to Kashiram. This practice was followed for many days. After few days proud took birth in Kashiram's mind. The thought that "I have the ability to give Dakshina to my Guru". In this way an ego arose. If anyday Baba did not take Dakshina, Kashiram became morose. If such feeling arises in a devotee's mind, it is considered as an obstruction in attaining Parmatma. Baba, who was omnipotent and who had great love for His devotees, knew every thought and feeling of His devotee's mind and heart. So He started demanding Dakshina from Kashiram many times. At last, Kashiram's economic condition declined to such an extent that he was unable to offer even a small gift to Baba. Even Baba asked him to take loan for offering Dakshina. Day by day the debt increased. Not a single person of Shirdi allowed Kashiram to stand near the door of his house. All this was Leela of Baba!!! In the end Kashiram repented. All his proudness melted like wax and said "I cannot give anything to Sai Baba. I dont have anything to give to my Sadguru". Henceforth as if some miracle happened and Kashiram's situation changed completely. He succeeded to such a extent that he lived his entire life happily and satisfactorily. I also love Baba a lot , a lot means a lot , frankly speaking He has done a ot of miracles in my Life. I sometimes think how to thank him. Now I have a wish that I prayed to Baba. Its about my dad who is in trouble , a court case is against him. My entire family is very upset with this. I want Baba to resolve this matter. My dad never believes in God , It is only to Baba's Temple that he visits and its to only Baba who he Trust's and Believes. Baba please help our family by solving this court case. We have lost all money , Home , respect in publice , now a court case. We dont know how to handle this. Please help us. Our give us the strenght to bear the pain atleast. We are helpless and trust only You now.